SpotFTP is an advanced FTP password recovery software. The program allows to find and recover forgotten FTP passwords for most popular FTP clients. The software offers administrators and users a comprehensive solution for recovering forgotten FTP passwords saved in users' computers. SpotFTP is an advanced ftp password recovery software for recovering forgotten ftp password for popular ftp programs. It recovers forgotten passwords for most popular FTP programs including FileZilla, Microsoft Expression Web FTP, WS_FTP, FTP Voyager, SmartFTP, CuteFTP, FlashFXP, SecureFX, WebDrive, AutoFTP, 32bit FTP, FFFTP, FTP Now, FTP Navigator ( FTP Commander ) , CoffeeCup FTP, DeluxeFTP, FTP Control,Far ftp and others. SpotFTP FTP Password Recovery offers administrators and users a comprehensive solution for recovering FTP clients passwords saved in users' computers. 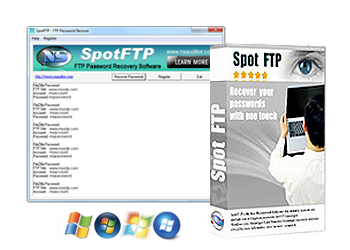 With SpotFTP you can recover ftp passwords for most popular ftp programs. It is an easy-to-use ftp password recovery software for recovering forgotten ftp programs passwords.